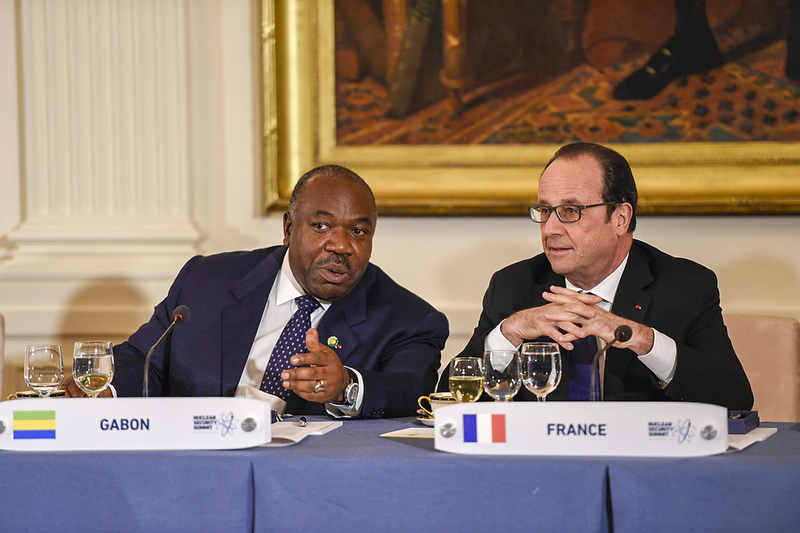 Image Description: President Ali Bongo (left) with ex-president of France Francois Hollande (right). On January 15th, Gabon’s president, Ali Bongo, returned home after an extended period of absence. The victim of a stroke in October 2018, President Bongo left Gabon for medical services. Leaving Gabon in political turbulence, in part engendered by an ineffective government, President Bongo’s return was timely. Days earlier, on the 7th of January, members of Gabon’s military, traditionally loyal to the government, staged a military coup in the name of “restoring democracy”. The coup was swiftly crushed. In the skirmish, the leader of the coup was killed, and days later, President Bongo returned to Gabon. Gaining independence from France in 1960, Gabon has had a mere five presidents since. Bongo was preceded by his father, Omar, who was president for a shocking forty-two years. Although President Omar Bongo’s time in office is hailed, by some, for its political stability, his era in office has not been free of criticism. Omar was a master in the craft of political choreography, granting those who opposed him with positions in parliament, causing his rule to be characterised by accusations of high-level cronyism and patronage. In addition, as a result of France’s policy of Franceafrique, Gabon and France retained close relations during Omar Bongo’s regime. Importantly, these close relations were far from free of corruption. Gabon is one of Western Africa’s wealthiest countries in respect of oil resources, yet, during Omar Bongo’s rule, much of the benefits fell to the hands of the few. So, while the regime may have brought with it political stability, it did little to develop the socio-economic position of Gabon’s rural population. Gabon’s authoritarian experience begs the question: political stability at what cost? In 2009, Omar Bongo died suddenly. Despite reports of a familial power struggle, Ali was elected to the presidency, leaving a bitter taste of nepotism behind. In 2016, President Bongo just about came out on top of a presidential election. The following day, the National Assembly in Libreville was set ablaze. Despite protests against the verdict, President Bongo was re-elected for his second term in office. Fast forward a few years, and here we are: President Bongo has returned, a military coup has been crushed, and Ali has just announced plans for a re-shuffling of parliament. Elitist politics aside, what is next for the citizens of Gabon? Given the historical complicity of French multi-national corporations in Gabonese corruption, as well the legacy of colonialism, it will be interesting to see where France places itself in the unfolding drama of the current situation. The French government has denounced the military coup, claiming that the attempt threatened the oil abundant country’s stability. We must ask, in who’s interest is this so-called stability? With an investigation underway regarding why there was a French commando in Libreville weeks before the coup, and as events continue to unfold, it will be interesting to see how France position itself in this potentially turbulent situation. Most importantly, however, my concern lies with the citizens of Gabon. Upon arrival home, Ali Bongo held a “re-shuffling” of cabinet behind closed doors. With reports of little change, commentators are remarking that the gathering was more likely to have been a collective request, or demand, of loyalty by the president. If this is the case, what will be next for supporters of the coup? Yes, institutions such as the African Union and states such as France have condemned the military coup. However, it is critical that this condemnation does not transcend into an indifference about what happens to the individuals who rallied in support of the coup. The international community has a responsibility to those people to pay attention to whatever events are yet to unfold in Gabon.